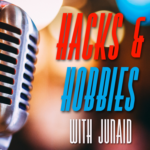 Hacks & Hobbies – Page 8 – Hobbies for Days. E135 – Anchor App Bugs, Book Recommendations, Crushing It. E133 – August 29 Apiary Update. E134 – Anchor updates, Gratitude.